Calistoga to Middletown, Lake County Highway, State Route 29. Not recommended for bicycles. Seven miles climbing a 7% grade, no shoulder for much of the way, blind s-curves, at least a dozen. Add a high temperature of 95 degrees to this Napa County Indian summer ride. Why? Because I wanted to. To get there without taking a lift. Or without putting my bike on the front of the Lake Transit bus which passed me twice during the grueling 90 minute ascent. The one saving grace was that traffic was fairly light, riding midafternoon on an October Wednesday. The descent was a great relief, after passing Robert Louis Stevenson State Park at the highway's summit. But too brief, leveling out and requiring at least 5 miles more pedaling to reach Middletown, after which there were 4 more miles to Harbin. But by golly, I can now say that I did it. Rode my bike over that mountain. Survived the ordeal. Next time? I'll be taking the bus. 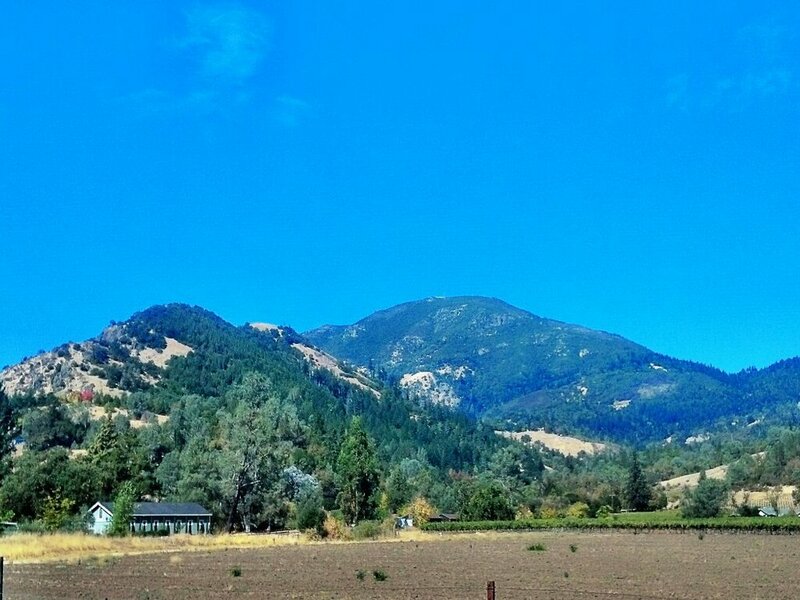 Or approaching from the north, via Lakeport. Tomorrow: a well deserved day off, resting, soaking in the hotsprings, sunning in the ridiculously warm Autumn in California.